Lesson plans and Dinosaur Safari rules used by Smithsonian Summer camp program. Team moves as a group if one member becomes aware all can see Dinosaur. Three Brave Hunters Sam (S), Taliesin (T), Arnold (A) and Randy (R) are exploring a well watered river area with a population of stegosaurs visited by pods of Brachiosaurus and the hunting ground of groups of allosaurs. Terrain is open veldt broken with patches of trees which are thicker around the river. Sam and Randy are carrying a Lee Enfield using explosive bullets with 5 shot clips. Arnold has a Paradox gun and Taliesin uses a .577 Express both are double barrel led and must be loaded separately.. Turn 1 -3 we walk without encountering any dinosaurs. Turn 4 Allosaurus encountered T fires and does 8 damage Allosaurus is stunned. , A fires misses. S fires twice and hits both times 4 damage each time. Kills allosaurus. Turn 5 - 6 Walk A, S, T reload. Turn 7 Hold and Allosaurus attack. T fires hits and stuns it. A misses and reloads. Sam hits it bounces. Fires again for 4 damage. Randy misses twice. T fires second barrel kills it. Turn 8 walk S, T and R reload. 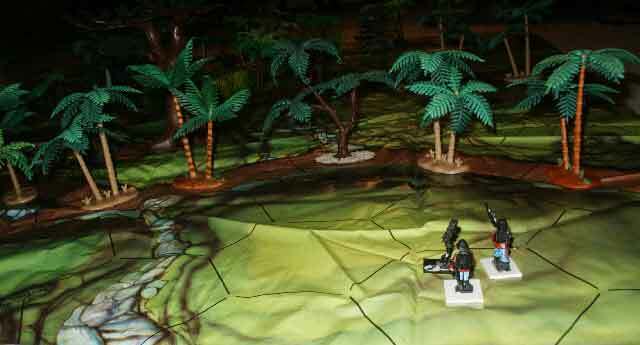 Turn 9 Ambush by Allosaurus T fires point blank both barrels both hit a kill. Turn 10 walking T reloads. Encounter 2 Allosaurus. A hits the Gray 7 damage then Sam hits for 4 damage gray is stunned. A fires second barrel. hits green for 7 damage. R hit no penetration and fire again misses. Turn 11 T walks away reloading. Rest of group hold reload and fire. R hits Green 4 damage fires again misses. S miss, fires again hits Green 4 damage. A shoot no penetration of gray. Green is dead. Turn 12 All hold All Reload. S misses twice. R fires twice 1 hit no penetration then misses. A fires miss and hit 7 damage to Gray it is stunned. Turn 13 All walk S fires misses , again 4 dame Allo is dead. Rest reload. Turn 14 Walk s reloads. Turn 15 walk join T. Turn 16 walk Stegosaurus encounter. Turn 17Walk reach river Allosaurus attack. A misses twice. S firs twice 1 miss 1 hit 4 damage. R fire 1 hit 4 damage All stunned. Turn 18: Allo recovers R miss, hit bounces. S fires 4 damage to stun. Turn 19: R shoots twice misses. S fires hit 4 Damage, fires and misses. A fires miss, miss. Allo bites off S head and runs off board. Turn 20: T walks hits remaining and kills Allo. R reload, A reload. Turn 21: All walk T reload. Turn 22: Group runs. Turn 23: Walk encounter 2 brachiosaurs. They stampede away from team. Turn 24: Encounter Stegosaur. R miss, miss. A hit damage 7 stuns stegosaur, miss. T separate move. Turn 25: R miss, hit 4 damage Steg Stunned. A reload. T run. Turn 26: R miss, hit bounced. A miss, Hit bounced. Steg kills R. T runs to camp encounters mob of 6 compies. They charge T. Turn 26: A hit Steg kills it. T hits 2 compies. Turn 27: T reloads. A walks reloads. Turn 28: A walks. T attacked by 4 compies 3 run away 1 bites for 1 damage. Allosaurus charges A. Turn 29: T in camp reloads. A fires at Allosaurus miss, hit bounces. All bites off A head. Only T survives after running off to camp and leaving the rest to be eaten.